Huawei Rotating Chairman Guo Ping (center) speaks in front of other executives during a press conference in Shenzhen, in China's Guangdong province, on Thursday. In the 2019 National Defense Authorization Act, Congress prohibited U.S. government agencies from contracting with Huawei or companies that use Huawei equipment. The U.S. government has alleged that Huawei is closely allied with the Chinese government and that its equipment could be used to spy on Americans. Huawei has denied the allegation and said it's a privately owned company with no interest in spying. In a lawsuit filed Wednesday in a federal court in Texas, Huawei argued that when Congress called it out by name, that violated the Constitution's Bill of Attainder clause, which prohibits Congress from singling out a company or individual for punishment without a trial. "The U.S. Congress has repeatedly failed to produce any evidence to support its restrictions on Huawei products," Huawei's Rotating Chairman Guo Ping said at a press conference announcing the lawsuit. "We are left with no choice but to challenge the law in court." By "blacklisting" Huawei, the company argued in its suit, Congress impugned "both its general reputation and its specific commitment to honoring the laws of the United States." Such a widespread ban on Huawei products will seriously damage its U.S. business, the company said. Huawei alleged that Congress illegally deprived the company of due process, "stigmatizing it by effectively branding it a tool of the Chinese government and a risk to U.S. security." 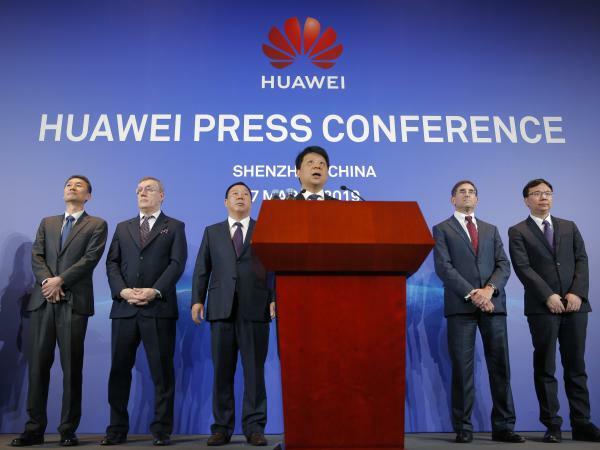 Mark Natkin, founder and managing director of Marbridge Consulting in Beijing, told NPR's Shanghai correspondent Rob Schmitz that U.S. intelligence agencies have identified Huawei as a clear threat to national security. "I think the chance that Huawei would win this case is tiny, if not almost zero," Natkin said. Natkin said the lawsuit is part of a legal and public relations offensive waged by the company to try to fight back against the perception that it's beholden to the Chinese government. In its suit, Huawei argued that Americans will suffer if they don't have access to its technologies. "Without Huawei equipment and services, consumers in the United States (particularly in rural and poor areas) will be deprived of access to the most advanced technologies, and will face higher prices and a significantly less competitive market," the company wrote. "In the area of 5G mobile service in particular, American consumers will have reduced access to state-of-the art networks and suffer from inferior service." Hofstra University constitutional law professor Julian Ku told The Washington Post that U.S. courts might not be receptive to Huawei's claims, given that "doing business with the U.S. government doesn't seem to be a fundamental right, and there are reasonable grounds for Congress to act against Huawei." The lawsuit ratchets up tensions in a relationship that is already strained, as the United States has sought the extradition from Canada of the chief financial officer of the company, which the U.S. Department of Justice has accused of violating sanctions on Iran.